London and France-based Holiday Goddess editor Emma Killick suggests you buy designer clothes at a fraction of the price, and help Breakthrough Breast Cancer. London has a plethora of charity shops. Obviously this is a good thing. The bad part is that you usually have to be in the right frame of mind to enter one; you know, you have to have the energy to sift through a pile of tat to find that bargain, fight your way into a change room, and cope with friendly but not very experienced staff. Well, in East Dulwich there’s a new shop called Give + Take where none of this mental or physical preparation is required. Everything is beautifully displayed, the staff are professional and helpful, and you won’t have to rat through all the racks to find the good stuff because it is all gorgeous. Here you can get designer clothes at a fraction of the price, with proceeds going to Breakthrough Breast Cancer. Give and Take has clothing as well as loads of great gift and home items (cards, candles, bedding, and the like). The stock is sourced by the owner, who has 30 years experience in the fashion industry, and the variety is impressive: everything from something you’d wear to the Oscars, to beautiful cashmere coats and simple summer tops. Most of it is new and the rest is donated. Designers include Pringle, Nick Hart of Saville Row (who dresses many a male celebrity), Hackett, Aquascutum, Jaeger, Kerei (otherwise only sold at Selfridges), Payne and Wrap. If you bring in your designer gear you can either donate it or get a credit note to spend in the store after it sells. 3 Lordship Lane, East Dulwich SE22 8EW, Tel: 020 7998 8993. Right next door is a lovely local pub called the East Dulwich Tavern (the locals call it “EDT”), 1 Lordship Lane, London SE22 8EW. It’s a large building on the corner with friendly service, wholesome food, and a great interior (I’m a sucker for some interesting Victorian tiles). 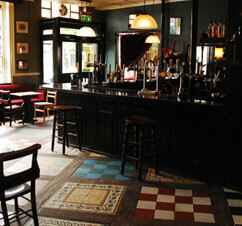 It’s won a Neighbourhood Pub Award and has cask marque status (that means the beer is good). You can leave your less enthusiastic shoppers in here while you ogle the goodies at Give and Take. Emma Killick is an avid gardener, California lawyer and UK solicitor. She has travelled all her life, and is now based in London, escaping often to a farmhouse in France.